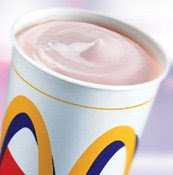 It has become a running joke between my wife and I, that anytime I wish to purchase a milkshake at a McDonald’s restaurant, the magical device that dispenses said beverage is broken. Apparently the mass produced apparatus that creates McDonald’s treats is so complex that the slightest deviation in its mechanism causes catastrophic dessert failure. In my experience, only the Hubble telescope requires more upkeep to perform its intended function. When they speak of it being “down for maintenance” the staff uses such a serious tone that you would think the night shift was back there dismantling the core of a nuclear submarine. So last Saturday night when we decided to grab an order of McNuggets, I playfully ordered a small chocolate milkshake. I fully expected the overly-rehearsed “Sorry sir, but the ice cream machine is out of order,” so you can imagine my surprise when the disembodied voice simply replied “Will that be all?” My wife and I exchanged curious glances as the speaker casually announced our total and told us to proceed to the first window. “It’s a miracle,” Ashley said “Your streak is finally broken!” I was still guarded though, as I fully expected the girl at the first window to inform me that they had forgotten to tell us that the ice cream machine was broken after all. However, our visit to the initial window was uneventful and we were instructed to proceed to the next window where our culinary delights would be dispensed. Suddenly, despite my best efforts to suppress it, I began to succumb to the hope that this would indeed be my night, the night that I had finally bested the McDonald’s ice cream machine. Rolling to a stop next to the final window, the employee quickly handed us the paper bag that undoubtedly contained the McNuggets and French fries. Then, just as she turned to acquire what I could only assume was my beloved McShake, a man appeared wearing a button-up shirt and a headset. Through past experience I knew that only one person was issued such dapper attire: the manager. I could feel fear rising in my throat as he and the employee began conversing just out of earshot. Ashley and I strained to hear what they were saying, but just as I thought we were making headway the employee reached back with her free hand and slid the window closed. Now we had been reduced to decoding the manger’s pantomimes in an attempt to understand this puzzling turn of events. Not ready to give up hope, I convinced myself that the manager simply wanted to make sure that the employee understood what a big moment this was for me. Perhaps the staff was arranging some sort of acapella tribute to my past struggles. I debated on whether or not to get my parents on speakerphone…..
After almost two full minutes of watching the pair through the glass, the manager slid open the window and calmly explained that the ice cream machine had broken immediately after I placed my order. He quickly elaborated that an employee had “pressed the wrong button” thus rendering the entire device inoperable for the remainder of the evening. I was so full of questions that I was momentarily speechless. What button did the employee push? Furthermore, why would you equip any device with a button that immediately prevents it from doing the only thing it was created for? Am I the victim of some sort of cosmic joke? The manager instructed us to move up the front rail and wait so that he could issue a refund for the milkshake and bring it to us. This was just great. Not only will I be denied my chocolate shake, now we are being put in drive-thru time-out, all because Jim-Bob got confused and pressed the “Initiate Total Dairy Failure” button on the machine. I swore that if I saw the car behind me get a milkshake I was going to set the indoor playland on fire before we squealed away. After several minutes the manager emerged from the side exit and handed me my $3 back. He was polite and apologetic, but I didn’t put much effort into hiding my frustration. So once again I left a McDonald’s drive thru with nothing but a super-sized order of disappointment.